The intrigue of Sovereign Wealth Funds (SWFs) was for a long time centered on their hidden geopolitical motives. This was especially the case during the commodity price boom of the early 2000s, when commentators and scholars alike perceived SWFs as vehicles for redistributing financial, and by extension political, capital throughout the world. Nerves ran high alongside the flow of money making its way out of emerging commodity-exporting economies in search of returns in mature, western ones. In one such snapshot, 2006 saw Dubai’s DP World forced to drop its leases on terminal operations at six American ports in response to overwhelming domestic anxiety. Would SWFs kindle a throwback to protectionism and monetary mercantilism? Before these questions could be fully answered, the 2008 financial meltdown shifted the entire conversation. Now, with a persistently dreary, opaque global economy as the backdrop, the focus is trained on issues like inequality, populism and climate change. Angela Cummine’s new book, Citizen’s Wealth seeks to pivot the analysis of SWFs directly into these important subjects. In its own words, the book “offers the first domestically oriented account of the impact of sovereign wealth funds on the citizen-state relationship,” and in the process of doing so, it delves into meaty questions about ethical investment, intrastate inequality and economic sustainability (p.4). The strength of the book lies in its central thesis. Cummine uses the principal-agent relationship to show that citizens (principals) are the rightful owners of sovereign wealth, and that their government (agent) is subject to a fiduciary duty to act solely for their benefit. This is no trivial point. While some might argue that citizens elect their governments and therefore governments are already expected to act in their interest, Cummine draws on a series of SWF case studies to illustrate how governments sometimes do have their own interests with various degrees of separation from those of their citizens. To prevent such ambiguities, the book puts forth a model of citizen ownership based on citizens wielding enhanced democratic control of SWFs and their benefits. There is no skimping on detail here – specific institutional structures are suggested, including adapting a condominium model to bring citizens into much closer contact with the governing body of their SWF (p.78). This pushes beyond the regularly issued calls for SWF transparency. “While information disclosure is a crucial part of democratic control,” writes Cummine, “the reforms discussed here demand more than that alone: they also require avenues for citizens to critique those decisions, feed back their views to representatives, select those representatives, and shape the desired purpose of the governing body in the first place” (p.117). She deftly draws on democratic theory to counter the ‘incompetent citizen’ objection – making the important point that a democratic control process can be a “mutually educational one between citizen and expert” (p.91). In a time when many people feel materially slighted by expert economic opinion, it seems wise to foster this kind of exchange and link it to concrete outcomes. While the knowledgeable and fine-tuned discussion of democratizing SWFs is impressive, the suggestion that the funds themselves are significantly more than income-seeking vehicles – that they are indeed “new policy tools proving instrumental in securing a wider set of values for an owning community” seems overly optimistic (p.109). Here, the book presents SWFs as levers that can, and should be, collectively pulled to impact two key areas: sustainability and inequality. Because of the coercive nature of SWF investment (citizens have no exit option should they find themselves at odds with their fund’s activities) and because the principal-agent relationship makes citizens complicit in their agent’s decisions, the book argues that there is a “special case for the imposition of an ethical investment duty on sovereign wealth” (p.100). This position is convincingly presented and effectively dismantles some objections (i.e. what if a community can’t agree on its ethics?). Cummine establishes a baseline responsibility where even if citizens prefer to shun all ethical concerns, a SWF considers future generations by respecting “a minimum obligation of sustainable investing” (p.112). Theoretically, this is a sound argument. In practice, because the impact of responsible investment in today’s economy is scantly known, the notion of meaningfully expressing community values through investment strategies is rendered questionable. While academic and media coverage of socially responsible investment has burgeoned since the early 2000s, the bulk of research has examined financial performance, in the vein of “Does it pay to be good?” Few researchers ask the more difficult question: is anyone actually being good? There is little consensus on which investment strategies are best suited for the kind of systemic change demanded by climate change, for instance. Screening and divestment strategies (avoiding/selling unethical assets) employ an influencing method that is the exact opposite of another prominent approach: shareholder activism (maintaining ownership to steer company management). Cummine acknowledges this contradiction but then frames it as less relevant to the point being made, which is about giving citizens a “meaningful sense of control”. Yet insofar as meaningful control means achieving ethical outcomes, this lingering uncertainty is critical. Selling off unethical shares could, for instance, result in suppressing the share price and effectively giving unethical investors a discount. Holding on to unethical shares in order to influence company management, on the other hand, requires coordinated, time-intensive engagement. A good example is Norway’s SWF – the largest SWF in the world and one seen as a role model of responsible investment. In terms of engagement, Norges Bank aims to vote at all general meetings, entailing 10,000 meetings and 85,000+ resolutions annually. As the book states, “the NBIM has limited institutional capacity and has elected to engage mainly with the largest (but not necessarily the most problematic) companies” (p.125). In terms of screening unethical shares, despite new exclusion criteria pertaining to climate, the fund’s biggest 2016 returns came from its holdings in the oil giant Royal Dutch Shell Plc and the oft-controversial mining company Glencore Plc. (Annual Report, p.36). It is doubtful whether these investments respect the ethical preferences of future Norwegians, whose very existence may eventually be threatened by climate change. Simultaneously, there is the fact that the foundation of most SWFs is at odds with addressing climate change – “around 60% of SWF assets [are] domiciled in oil- and gas- producing countries” (p.195). 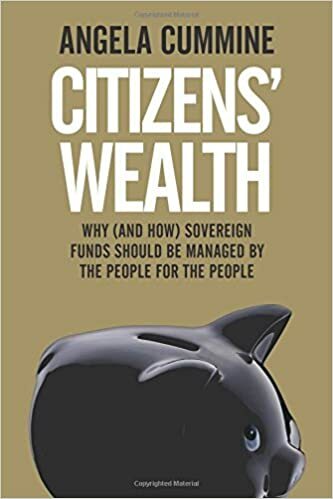 In one of the final chapters, Citizen’s Wealth poses that SWFs can “act as vehicles that spread the ownership of capital in an era where private ownership has become a leading driver of inequality” (p.183). It argues that because returns on wealth as a fraction of national income are increasing, the state should maneuver to capture a bigger share of those profits by becoming a capital owner on behalf of citizens. The returns on this capital can then be doled back out in potentially equalizing ways. But there is a paradox nested in this assertion. While high corporate profits are one side of the coin, low worker wages are the other. When US corporate profits reached an 85-year peak in 2014, employee compensation stooped to a 65-year low. This is no surprise: the cost of labor is a corporation’s largest expense. As Goldman Sachs’s chief US economist notes, “The strength (in profits) is directly related to the weakness in hourly wages.” What does this imply for citizen-owners of SWFs? By attempting to acquire a sliver of corporate profits, can they inadvertently end up betting against their own wages and/or those of other workers around the world? This raises questions about where exactly political capital should be deployed to effectively address growing inequality, and SWFs do not emerge as a straightforward answer. Another element worth pointing out is that within corporate profits, the finance industry has loomed large. A main driver of finance’s speedy growth? Asset management. Cummine points out that market complexity necessitates that investment decisions are delegated to internal or external fund managers. Late last year, the UK Financial Conduct Authority published a searing 200-page report finding that asset management companies had an average profit margin of 36% over the past six years – a figure that dwarfs other industries even though the majority of active managers underperformed vis-à-vis indices. And although institutional investors such as SWFs got a better deal relative to the expensive products sold to less sophisticated investors, this abuse of information asymmetry and trust may give citizens pause as they mull over assuaging inequality at the cost of financing this industry. “SWFs offer a unique solution”, Cummine writes, “unique insofar as the funds present a radical yet simultaneously conservative tool for tackling inequality, one that is deeply compatible with capitalist institutions.” (p.191) While true, this same premise requires us to tread carefully when evaluating the viability of SWFs, and indeed of capitalist institutions as they currently stand. Citizen’s Wealth, in presenting a truly compelling model of democratic citizen ownership opens the door to this conversation, even if it doesn't explicitly intend to. G20 Policy Brief - The G20: Circus without a Ringleader? G20 Policy Brief - Can the G20 save our Multilateral Trading System?